Whole new look and Green Screen! Smoovie is a professional stop motion animation app with a unique user interface based on scenes and frames, designed to make it easy for kids to tell stories in a fun way. Simple and intuitive to use, it has all the features pupils need to be as creative as they like in the classroom without having to struggle with over-complicated software. 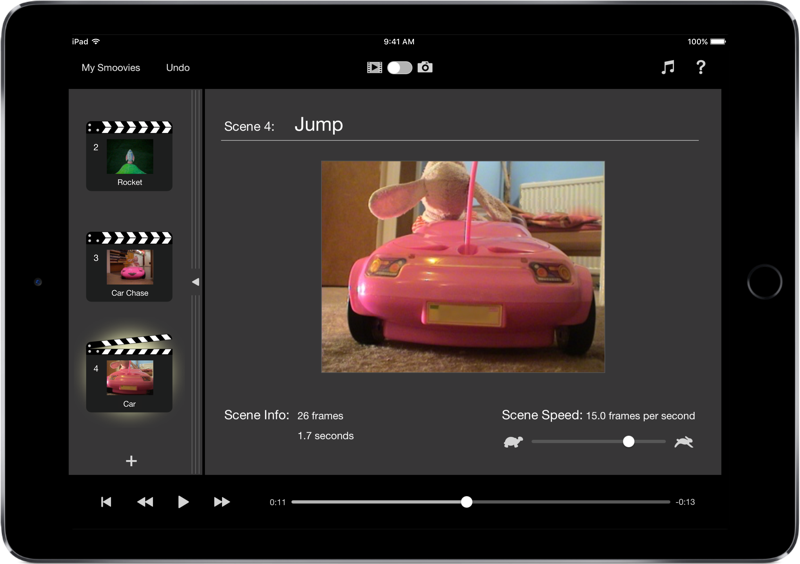 Green Screen lets pupils explore the furthest reaches of their imagination and, with audio recording, they can add their very own narration, giving their projects even deeper learning value. Built in teacher resources give easy access to downloadable PDFs, example lesson plans and stop motion animation ideas … everything you need to get your class up and running! We fully support Apple’s Volume Purchase Program too, so schools can benefit from our special educational discount. Stop motion animation is widely recognised as a innovative and valuable learning tool which can be used right across the curriculum. It gives pupils a fun and interesting way to explore and express their ideas on any subject; be it maths or music, science or social studies. Record your own audio straight into your finished project, or pick a song from your Music library. Browse through your projects and share them with the world from the Library. Simply swipe the scene list to the left to reveal the filmstrip where you can edit individual frames. Smoovie’s elegant interface gives easy access to powerful editing options. Smoovie for iPad instantly plays back what you've captured - without rendering. Rendering interrupts your creativity and fun and wastes your time. We think you deserve better and we believe Smoovie is the fastest (and most fun) app for creating stop motion animations! This magical feature lets you choose any image you like as a background to your movie. Your characters can walk on the moon, trek through the jungle or explore the bottom of the ocean … anywhere your imagination takes you. The possibilities are endless! Arrange your content in scenes. Each scene has an independently adjustable playback speed, allowing full control over the pace and mood of your animation. Mix it up! You can add new scenes, cut, copy and paste existing scenes - all with full undo support. Swipe across the list of scenes and see all frames in your project. You can cut, copy and paste individual frames - with full undo support. You can drag frames from one scene to another and even copy frames from other smoovies. Onion Skinning is possibly the most important feature of a stop motion animation app. It works by making the live video from either of the iPad’s cameras semi-transparent and superimposing it onto the previous frame. Record your very own audio right from within the app! Whether it’s an awesome voiceover or fabulous sound effects, audio recording lets your imagination run wild! Smoovie allows you to browse the Music library on your iPad so you can choose the perfect soundtrack for your masterpiece. Smoovie makes it easy to export your animations to be used as content for other apps. Write your own soundtrack in GarageBand or add some opening effects in iMovie. 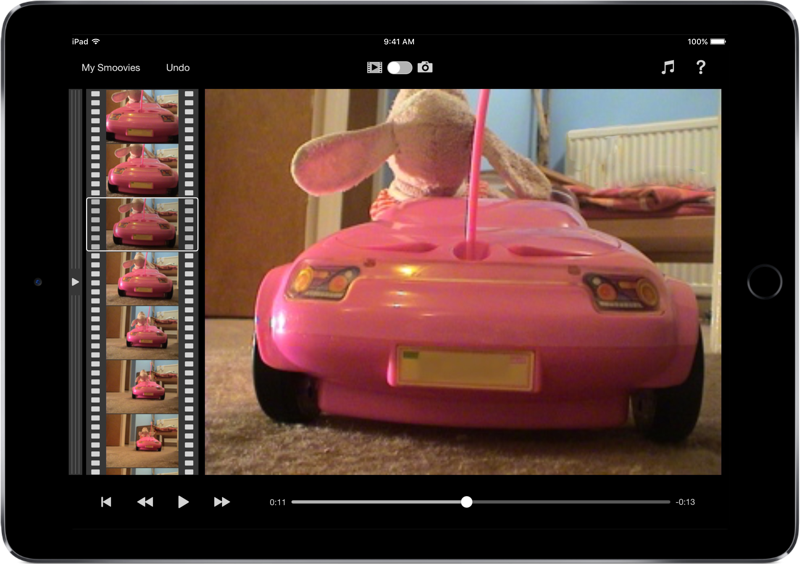 Smoovie lets you export your animations in HD to the Photos library on your iPad. And if you've got Apple TV, you can play your creations using AirPlay Mirroring. Copy and paste works from other apps that you love. You could use pictures from the Photos app, create titles with Keynote or turn sketches from your favourite drawing app into cartoons. Simply create, copy and paste!